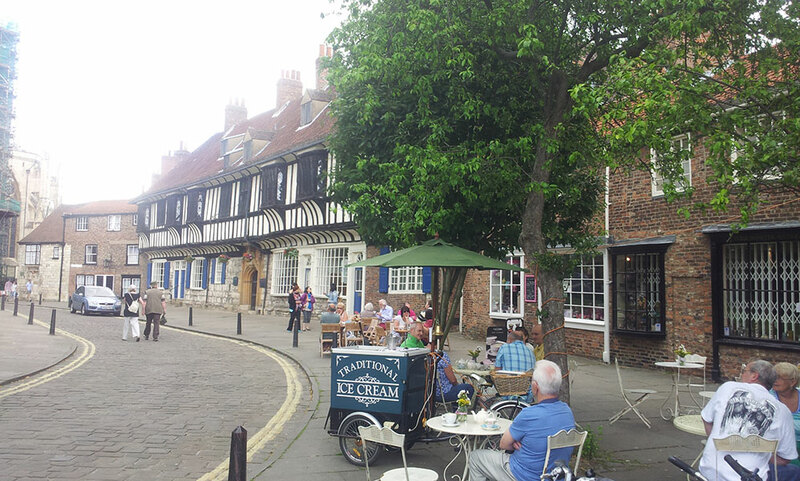 Nestling in the shadow of the Minster, this little gem comes into its own in the summer with plenty of tables outside on a mini-plaza (almost). 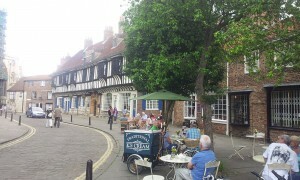 As well as the Minster, it is right next to St William’s College a Grade I listed building, and the National Trust shop. 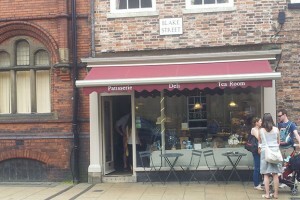 It sells good coffee and great homemade cakes and treats. And even when the sun is not shining there are places to sit inside and upstairs with a perfect vintage vibe. 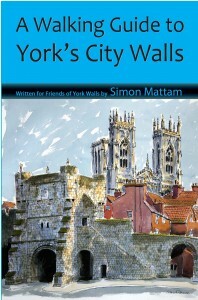 Definitely worth a visit after you have spent a few hours visiting York Minster. Manion and Co describes itself as a Bistro cafe, deli and artisan bakery – and the food is as delicious as that description. An ambitious mix of French, Italian and Yorkshire cuisine means that you can choose from a range of cheese, charcuterie and olives from across the continent, along with exquisite artisan bread and the odd sausage roll! As well as all this the bistro has an ever-changing daily specials menu and there is wide selection of freshly baked cakes. To top it off the tea premium coffee from Ue Coffee Roasters and fine loose-leaf tea from Jeeves and Jericho, from Oxford. To be blunt, this is a cafe in a former church. 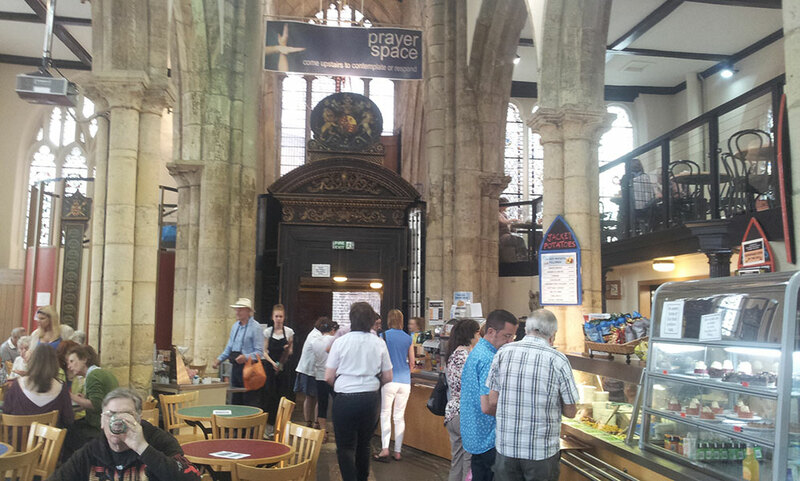 It is a really lovely building and you can sit high up near the arches peering through the stained glass windows…it’s a pretty unusual place to have a cuppa. The oldest parts are from the 12th century but, as ever, many parts of the building have been changed at different times in its life. Whilst it is still used as a Christian centre for the community it is also been known to have live music and to be used as an art space. You can also sit outside and on a Saturday in the summer there is often a really good band playing on the street directly opposite. (The busking in York is so good now that most acts seem to bring as much equipment as at a full gig). If you catch these guys playing you are in for a treat. 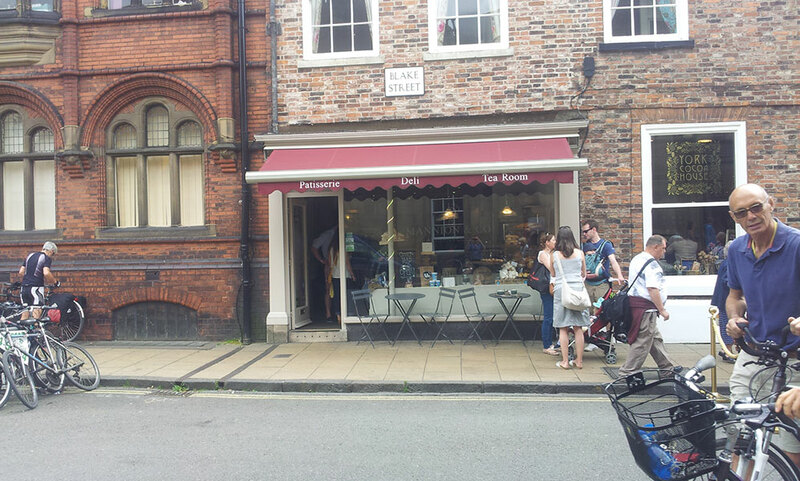 Posted by YorkTalk on July 22, 2014 in Uncategorized.